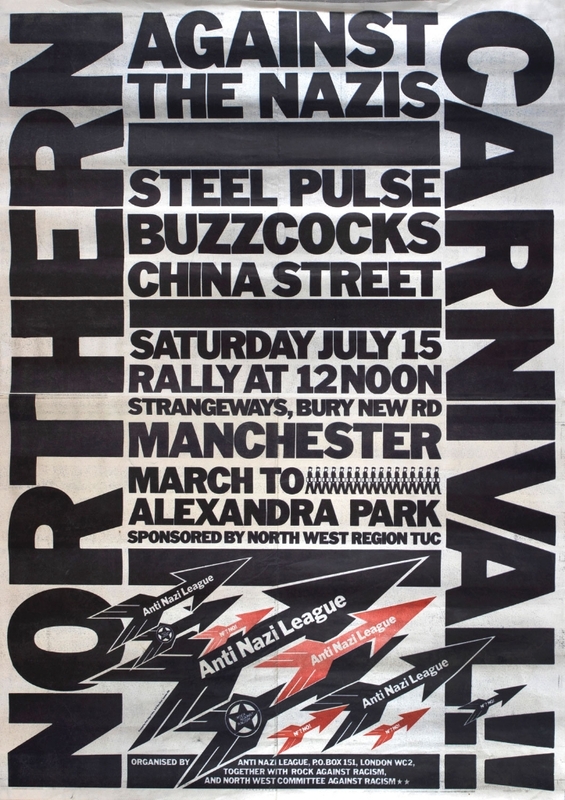 Poster: Northern Carnival Against the Nazis designed by Dave King, 1978. It was on the train home from the Carnival in London that Geoff Brown (ANL) and Bernie Wilcox, who had already been promoting small RAR gigs across Manchester, decided that together they would organise the Northern Carnival Against the Nazis. Ten weeks of intense work followed with many volunteers and sympathetic organisations lending a hand. Hundreds of people made special banners, placards and badges, and helped to book coaches from outside Manchester. There weren't as many of these posters available as hoped because the Anti Nazi League office in London had been firebombed. Moss Side band Exodus (X-O-Dus) were added to the bill after this poster was printed, recommended by reggae DJ and future RAR organiser Debbie Golt. This item was featured in Manchester Digital Music Archive's 'We Are Dynamite! Northern Carnival Against the Nazis 40th Anniversary' exhibition, held at Niamos (old Nia Centre) in Hulme in September 2018.